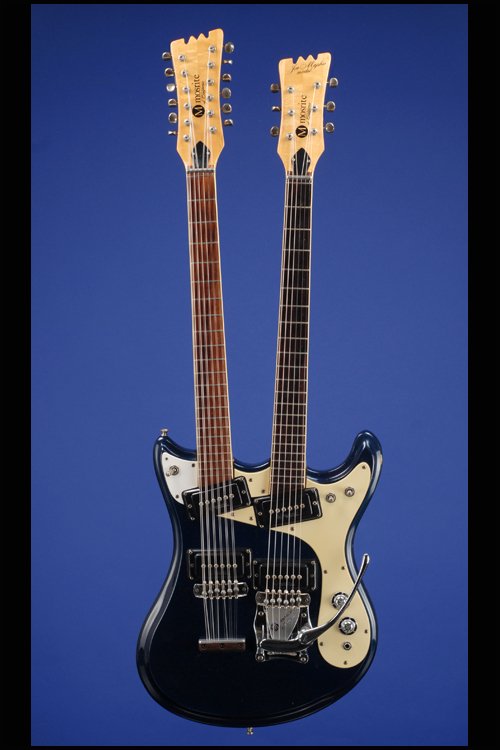 Joe Maphis Model Double-Neck 6/12 String Guitars | Fretted Americana Inc.
1966 Mosrite Joe Maphis Model Double-Neck 6/12 String. This custom-color 1966 'Joe Maphis' double-neck (six-string neck in the lower position combined with a twelve-string neck in the upper position) weighs 11.50 lbs. The regular six-string neck has a nut width of just over 1 9/16 inches and a scale length of 24 3/4 inches; the twelve-string neck has a nut width of 1 11/16 inches and a scale length of 24 3/4 inches. 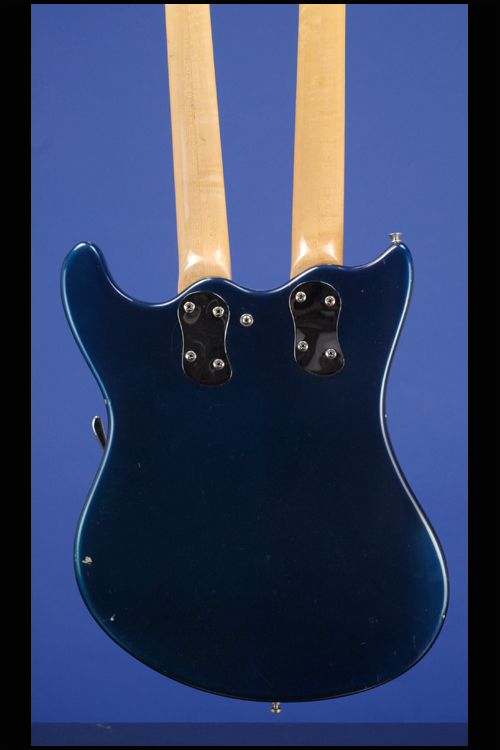 Two-piece alder body with 'German Carve' scalloped top-edge (14 13/4 inches wide and 1 3/4 inches deep). Two two-piece, lightly-flamed maple necks, both with thin and fast profiles and single white-bound 'slab' Brazilian rosewood fretboards. The conventional guitar has a zero fret + 22 original 'speed' frets, small inlaid single, double & triple clay dot position markers. The twelve-string guitar has a zero fret + 22 original 'speed' frets and small inlaid single & double clay dot position markers. 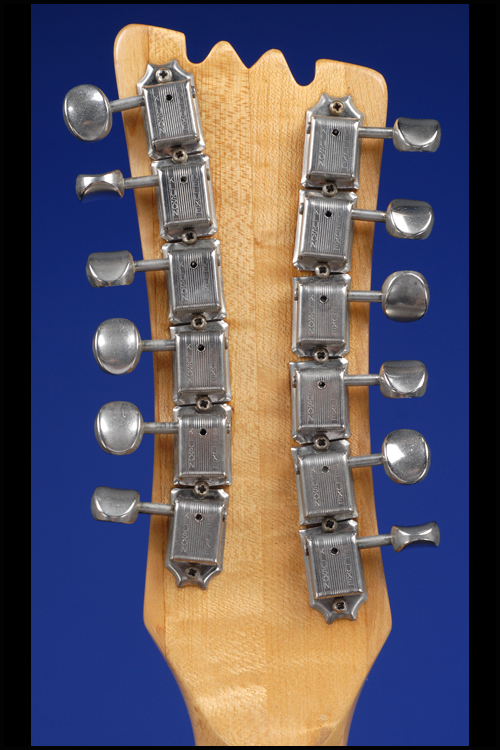 Serial number "2J 222" blind-stamped on the twenty-second fret of both necks. 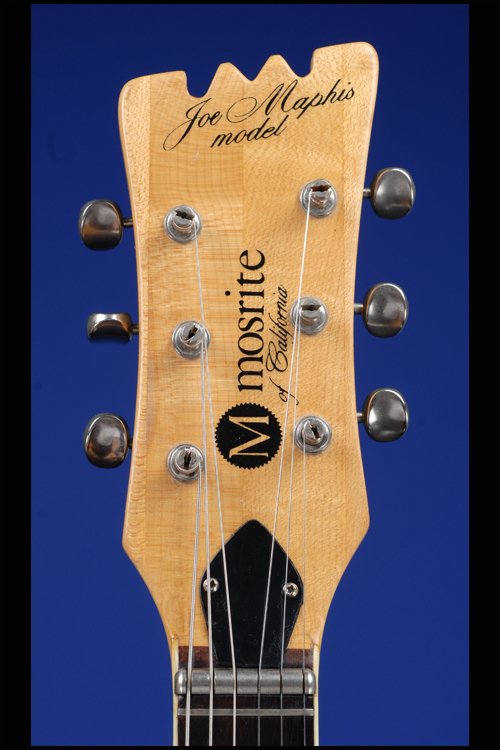 Black headstock decal "M MOSRITE / of California" and "Joe Maphis model" on six-string headstock face, similar decal on twelve-string headstock without the additional 'Joe Maphis' designation. 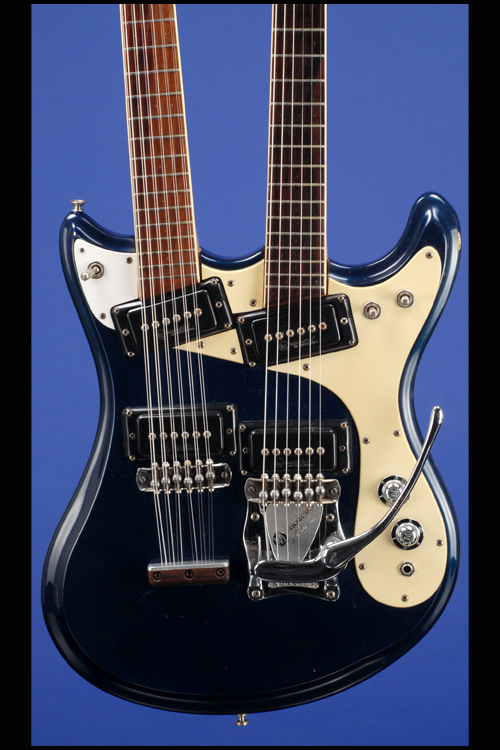 Both necks with unique Mosrite 'M' shaped headstocks and individual Kluson Deluxe 'double-line' tuners with oval metal buttons with "D-169400 / Patent No." stamped on the underside. 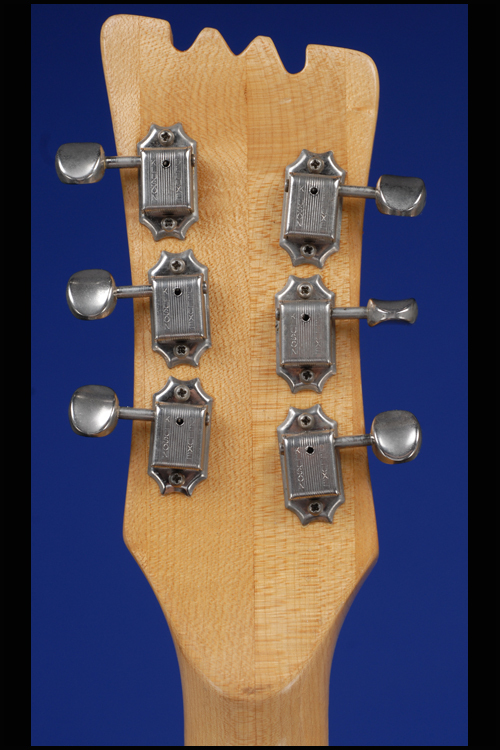 Each headstock has a black plastic truss-rod cover secured by two screws. 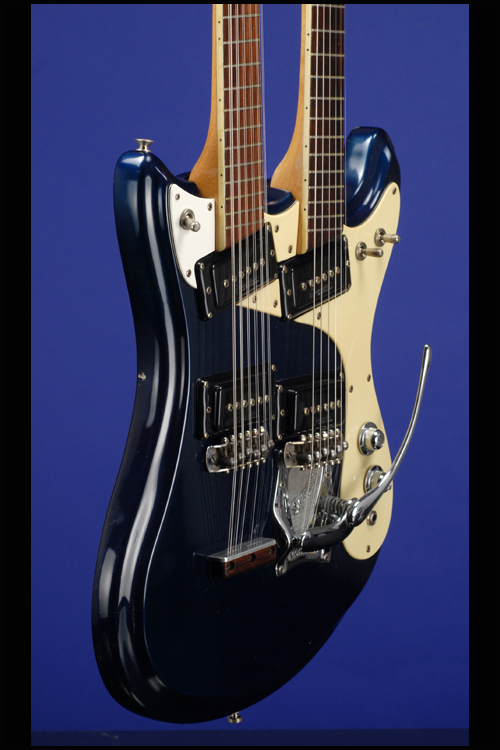 Two Mosrite single coil pickups with black plastic covers with "Mosrite of California" embossed on the lower edge and outputs of 10.44k and 9.25k on the regular guitar and two Mosrite single coil pickups with black plastic covers with "Mosrite of California" embossed on the lower edges with outputs of 10.40k and 10.42k on the twelve-string guitar. Three-layer cream over black and cream plastic pickguard with bevelled edges secured by eight screws. 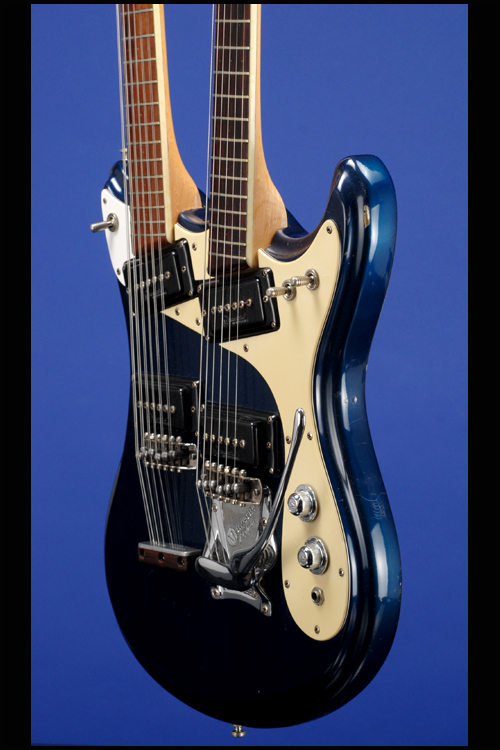 Two controls (one volume and one tone) plus three-way pickup selector switch (for the six-string neck), three-way neck selector switch and jack input (all mounted on pickguard). Bass horn with three-way pickup selector switch (for the twelve-string neck) on its own small three-layer pickguard in the same material (but a little lighter in color), secured by three screws. 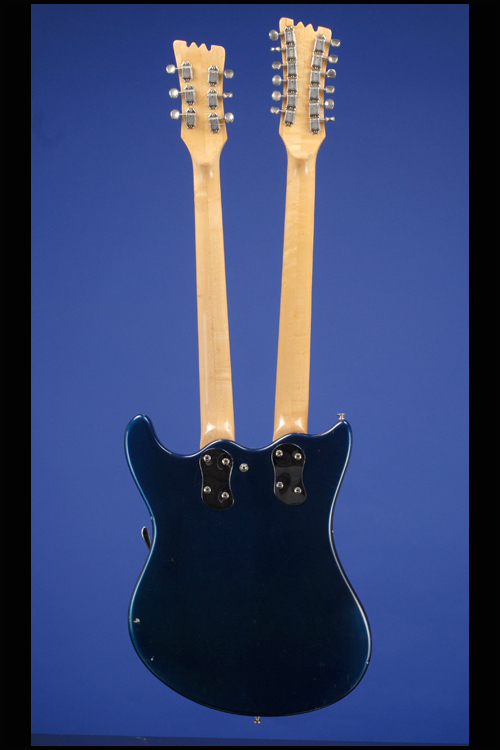 Two additional and similar material pickguards (each with two screws) between the two necks. The potentiometers are stamped "134 6623" (Centralab, June 1966). 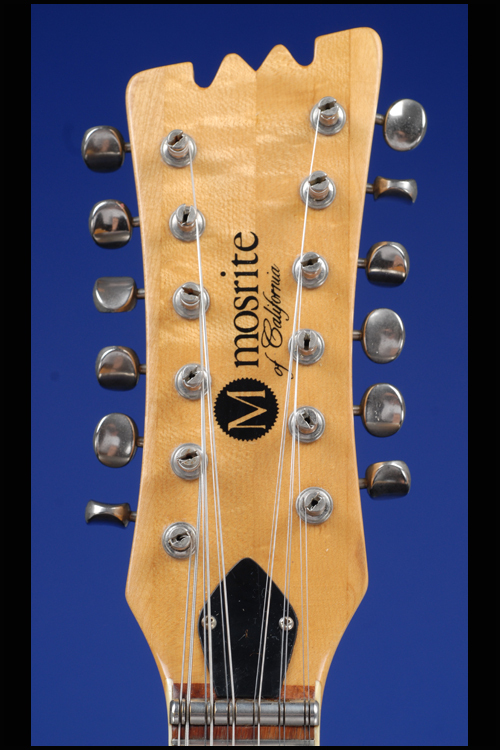 Mosrite 'hat type' 'V' & 'T' chrome control knobs numbered 1 through 5. 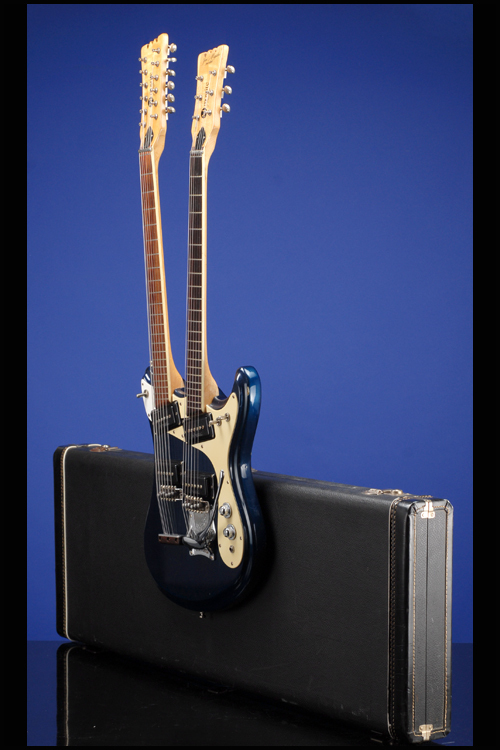 The six-string guitar with a Mosrite individually adjustable six-saddle bridge and chrome-plated die-cast Moseley 'Vibrato' tailpiece unit secured by four screws. 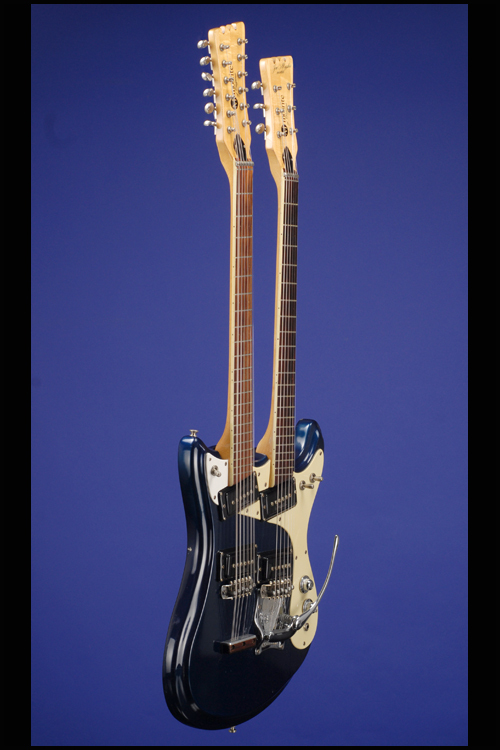 The twelve-string guitar with a Mosrite individually adjustable six-saddle bridge and a rosewood and aluminium stop tailpiece secured by three screws. 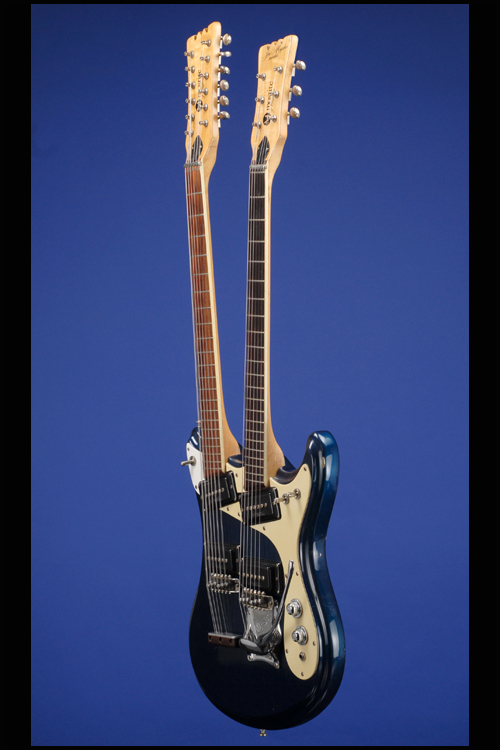 This really great mid-sixties double-neck is in exceptionally fine (9.00) condition with just a few very small surface chips on the edges of the body. The Pacific Blue color is rich and unfaded and there is the absolute minimum of wear to the original frets on both necks. This guitar looks, plays and sounds just as it should. Housed in a later three-latch black hardshell case with black leather ends and red plush lining (8.50). "D-169400 / Patent No." stamped on the underside.